. The Glossa Wedding Experience is relaxing, fun and professional. Let Glossa be your something blue. All clients have two options: we can come to you or you can come to our studio. The choice is yours! 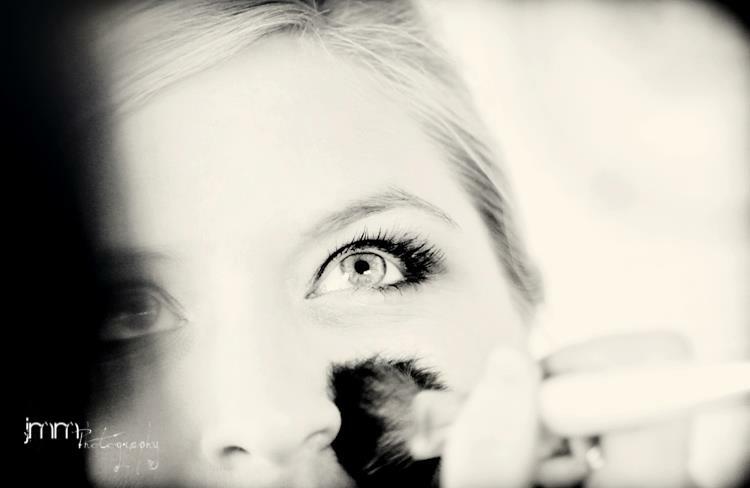 $60 Bridal Preview Session - To be done at the Glossa Studio, 1-2 hours to perfect your look for the wedding day. Bridal Makeup comes complimentary of the option of traditional OR airbrush foundation, complimentary waterproofing, and complimentary lashes. Lip color may be purchased from your artist for an additional fee if we have it available but we encourage EVERYONE in the bridal party including the bride to bring a color of choice with them. Bride Hair: TOTAL $150 - If you are JUST booking a hair stylist this is how the pricing looks. $75 - Bridal Preview Session - Trial run for the wedding day look, be sure to communicate ahead of time what you are wanting with your hair so we can send to the stylist so they know in advance if they need anything special for the appointment. How does it work if you book BOTH makeup and hair? There isn't a "discount" for booking both since there are separate people doing makeup and hair. However, you only have to pay 1 deposit. The deposit is $60 for just makeup or makeup and hair together. What's the benefit of booking makeup and hair together if there isn't a price difference? Simple, it's easier for you! You make 1 deposit, so you don't have to do multiple deposits with multiple people. Glossa coordinates connecting you to the hair stylist to book a trial run, the contracts, Glossa makes the timeline for the wedding day for makeup and hair so you don't have to worry about communicating with multiple people on makeup and hair AND we know the stylists we work with work, so we can recommend the services you will get. Yes, you still pay $180 total for Bridal Makeup and $150 total for Bridal Hair (together $330) but the hassle of communicating with multiple companies is reduced. And of course with Glossa services, we don't charge an on location fee for hair either (unless it is out of the 30 mile range) unlike MOST salon stylists will charge more to come on location and out of the salon on the wedding day. We do all our weddings on location FREE with a 3 face plus bride booking. First 30 miles from studio are free, after that $0.75 per mile to be charged. If there are FEWER than 3 faces, a travel fee will apply. The travel fee covers most areas in 275 loop of Cincinnati. We go out of town for on-location weddings as well. Contact us for specific travel fee information for out of town accommodation. Our bookings are done on a first-come first-serve basis and a deposit must me made in order to reserve the day for your wedding. We will ask you to sign a contract as well once the deposit is made. Bridal Experience is the same price for in-studio as on location….see above pricing. Available as an addition to a booked bridal service. Starts at $30 and up depending on size and time. Inquire for specific pricing. Please contact us! We can arrange everything from wine tasting to catering and limo service in addition to makeup or spa parties! How does Glossa booking work? Lyndsey will be your point person, she is the owner of Glossa and will be the person you communicate with most about details of your wedding. Your confirmations and contracts will be dealt with through our scheduling system and on your trial run date you will meet your artist!! This will be the same person for your wedding day. After the trial run you may have exchanged phone numbers with your artist but if you have any questions about your wedding day including timeline, you will communicate with Lyndsey about that lyndsey@glossamakeup.net If you need your artist the day of the wedding or the day before, feel free to reach out to your artist directly at that time. It seems confusing BUT we promise that it keeps the communication flow easy and consistent. When I fill out the Glossa Docs, where do they go? Because of modern technology, we can easily have you fill out your event details sheet and your contract directly from our website. Then copies of these DOCS are added to an online client folder that we can access and share with your artist so everyone is on the same page all the time. The sooner you can fill out the Event Details form, the better so that way we have an idea about your wedding plans. We can always make changes to this form if needed. The contract is binding, so we ask you have the details of it correct. It is DUE 31 days out from the wedding but as soon as you can fill it out the better we are for clearing up any questions and getting it straight. If you would like a copy of the DOCS sent back to you for your records, NO PROBLEM! Just let us know!!! I have seen makeup artists advertised online that appear to be cheaper, what is the difference in makeup artists that charge less? We love this question...Our artists are all extremely experienced artists with professional training. We have worked very hard to study every aspect of artistry including lighting and photography to make sure you look your absolute best in your wedding pictures. We know what looks good on all different skin types because we have worked with people of all races and ethnicities. We have a combine experience of over 30 years in the makeup industry. Our artists have worked with professional artistry companies and highly respected makeup artists in the TV and Film industry. We bring to you experience, professionalism and best of all amazing "camera ready" makeup. With that said, our prices reflect our experience. We are priced to meet the standard in the professional on location market. What kind of makeup do you use? We do not sell makeup, so we are not committed to using one line. We use all high end makeup. Having your makeup done is a luxury experience so our products reflect that. Some brands we use include YSL, Chanel, Makeup Forever, Laura Mercier, Bobbi Brown, Trish McEvoy, MAC, NARS , Smashbox and more. We also integrate products that are used in the TV/Film industry...and we may throw in a few drug store brands occasionally. We may run promotions for off season weddings or large groups, but typically we don't discount our prices. We recommend to brides on a budget to think about the in studio route or a DIY lesson! Check our blog or contact us for information about promotions. Send us an email to check to see if your wedding date is available. Next, pay a BRIDAL DEPOSIT ONLINE by Going to "Book Now". Once we confirm we received the check we will send you a receipt for your records. Is my deposit refundable? Once the deposit is made it is non refundable. If your wedding date changes and it may be transferred to another date if the artist is available. What is the difference between traditional and airbrush application? Airbrushing is a newer process where the foundation is pumped through an air machine. It is a lighter weight feel. Although all Glossa foundation is long wearing, airbrushing offers an even longer wearing coverage. Please check out our blog for the pros and cons of using airbrushing. ( http://glossamakeup.net/glossa/the-truth-about-airbrush) It is an upgraded fee for party members. When do I schedule a trial run? Can I do a trial run before I make a deposit? Yes! Your date is not set "in stone" without a deposit made however. The trial run is $60 and if you choose to book with a deposit is put toward the total of $180. Can my mom have a trial as well? Sure! Anyone can have a trial who wants one. It is $60 per trial. 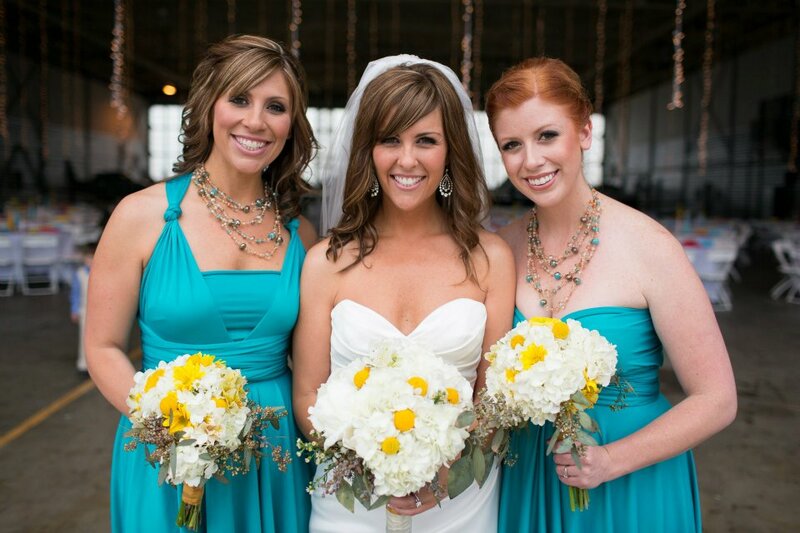 Can my bridesmaids pay individually? Absolutely! When you sign the contract you will put down how many bridesmaids you are committing to have their makeup applied. Even if your bridesmaids pay separately, you are ultimately responsible (whomever signs the contract) for their payment whether or not they back out or don't have payment available. Do I have to commit to a timeline for my wedding? Yes, we will have you fill out an Event Details sheet along with your contract. At this time we will confirm a timeline with you based on your start and stop time. Be sure to be aware of the late fee and second artist fee in the contract when considering your planning options. We don't want to get through this process and have awkward conversations about "fees" with you just before your wedding or ON your wedding day, so please take note to everything you are signing BEFORE you agree. As always, if you have specific questions reach out to us! How much time do you plan per person? All artists are different, but Glossa artists have it down to a science to make your wedding day go smoothly. We schedule 30 min per face and an hour for the Bride. Sometimes people don't think that it is enough time however, we promise that we know what we are doing. You can request more time per person, however if it requires another artist, the second artist fee policy will apply. 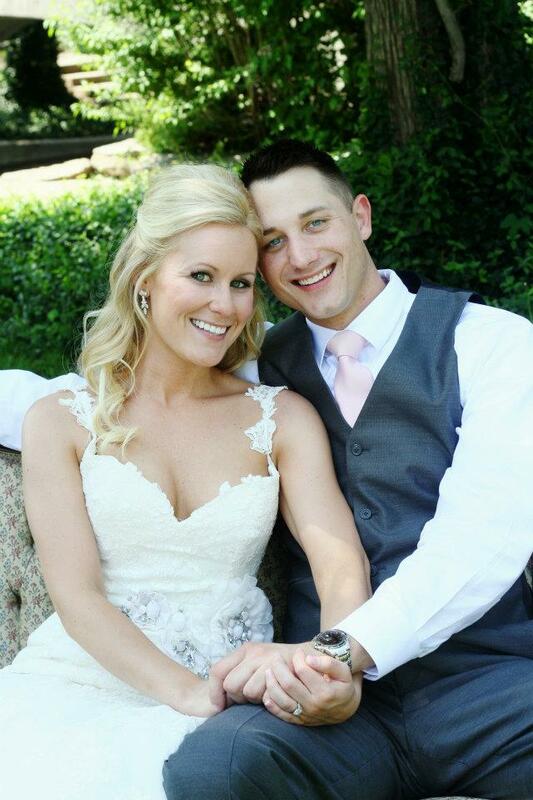 Please contact us if you have any questions regarding your specific wedding party needs. "Our hair stylist is bringing two people, why isn't makeup?" ? This is a question we get a lot and the answer is simple. Makeup and hair are very different. Hair takes a lot longer depending on the thickness and style of hair. People have lots of options for hair styling that may be more intricate so hairstylists simply need to plan more time per client than we do. Makeup, can be pretty predictable. Sure, a client may have problematic skin but there isn't typically circumstances that need more time, just a different application process. Therefore, we KNOW how much time we need per person unless you report to us extreme conditions like burns or scarring that may need more time and attention. Can I book Multiple Artists? Of course! We have many artists that we can book. 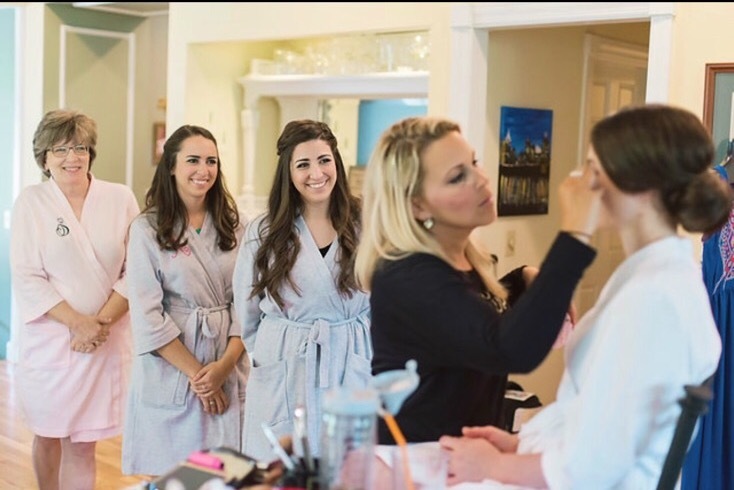 We have a policy that our primary artist needs to be booked 75% of the bridal party makeup since we only book ONE wedding per day, so when you book your artist you have them for the entire day regardless of your timeline. If you need an additional artist, we have a fee for booking more than one artist since usually the second artist is doing overflow of the first artist. It sounds complicated, but we promise it's not. Contact us for specifics for your party and a price quote for your specific needs. How do I know if I have a large wedding party? We consider 3 face - 8 faces an average size party and if you have a normal timeline one artist can accommodate the Bride plus this party. A large party is 9 faces and up and may require a second artist. The Bride is not included in these numbers. Can I pay in advance for my wedding day makeup? Yep! We will take payment at anytime and give you a receipt when we do so. Cash and Check are best for all of our artists take them of course. Some of our artists take Venmo (Lyndsey, Angela and Carmen) If you have any question, let us know and we will confirm for you. Where do I go for a trial run? The Glossa Studio is located at 3137 Riverside Drive, Cincinnati, Ohio 45226. It is very easy to find, approximately 8 minutes from Downtown Cincinnati. Call for specific directions.